FIBA Technologies, Inc., an American-owned manufacturer of gas containment equipment and services, has acquired Light Store, a California-based manufacturer of Type IV composite vessels. 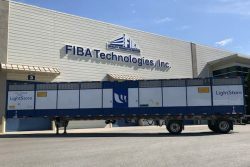 The acquisition allows FIBA to continue to diversify its product line and offer one of the most innovative gas storage solutions available on the market today. Light Store launched their composite pressure vessels in 2016 in a high capacity gas transport module that incorporates these ultra-lightweight and low-cost carbon vessels. Light Store was granted a special permit by the US Department of Transportation Pipeline and Hazardous Materials Safety Administration (PHMSA) based on testing per ISO 11515/ISO 11119 and by the American Bureau of Shipping (ABS). The first Type IV trailer will be shipping from FIBA December 14th. For more information, visit www.fibatech.com. FIBA Technologies is a member of NGVAmerica.